The case is made of steel and plastic, employing a straightforward (perhaps traditional) design with textured sides and a mesh face. It weighs 9.2kg, standing at 507mm in height, is 510mm deep, and 235mm wide. As a specialist’s ‘toy’, the Source 530 employs a comprehensive air and liquid cooling combination. It supports a 360mm radiator on top or 240mm radiator in front, alongside native support for NZXT’s 280mm liquid cooler, named Kraken X60. With the ability to house up to nine fans, airflow options include three 120mm or two 140mm fans on top, two 140mm or one 200mm fan up front, a 130mm or 140mm fan in the rear, a 120mm or 140mm fan in the internal pivot slot, and two 120mm fans on the bottom. 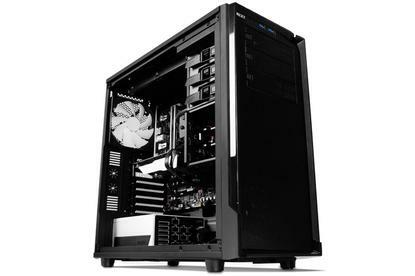 Bays and expansion slots include: three 5.25-inch external; six 3.5-inch internal; seven (one behind the motherboard tray) 2.5-inch internal; eight expansion slots. External ports include one audio and microphone combination port, two USB 3.0 ports, I/O LED, power/reset LED, and 10-port fan hub. The chassis also has 34mm of cable management clearance inside. The Source 530 is available in Australia and New Zealand for $AUD112 and $NZD189.99, respectively. While only Overclockers carries the product in NZ, Australian suppliers include: Australia IT, Computer and Parts Land, IJK International, PC Case Gear, Australia Computer Only, Photech Computers, Scorpion Technology Computers, IT Warehouse, Centrecom, D&D Computer Tech, Digital Matrix Computers, UMART Online, PLE Computers, and SkyComp Technology.